While April 21 has been designated and celebrated as John Muir Day in many parts of the world, including California and Scotland, Meaford has dubbed this Saturday, September 26 as our own, homegrown John Muir Day. As we’ve written before, famed naturalist, author and environmentalist, John Muir spent a productive couple of years in Meaford, working at the Trout Hollow Mill. On Saturday, the Meaford Museum will celebrate Muir and his Meaford connection with a guided tour of the Trout Hollow Trail, including a visit to the site of his cabin and information about the archeological dig that determined its location more than a decade ago. The tour begins at 10 a.m., and admission is $5, with tickets available at the museum. 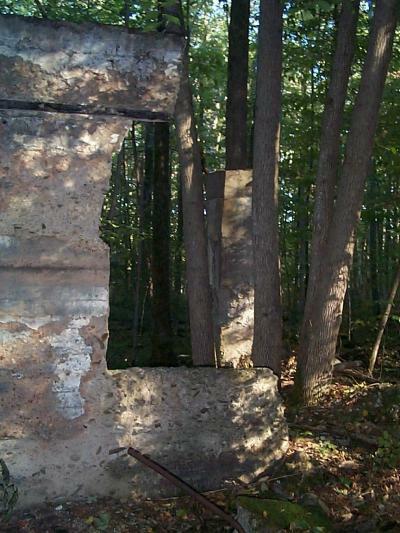 With the leaves beginning to turn and the weather freshening, it’s the perfect time for a hike along the river trail, which also follows an old elevated mill race and visits the concrete ruins of one of Meaford’s early power stations. Back at the museum at noon, an open house begins with a scavenger hunt and displays by local artisans at the newly expanded museum gift shop. At 3 p.m., enjoy a talk on “John Muir in Canada – Contributions to a Philosophy of Nature”, by Connie Simmons, an Alberta Muir scholar who completed her dissertation on John Muir in Canada at the University of Alberta in 2007. The day wraps up with a series of musical performances at the Harbour Pavilion, including Bambalamb on percussion, Billy Fairley on drums, the Celts, Seamus the Piper and more. 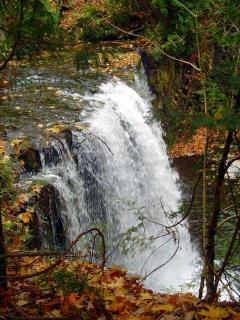 With spring seriously here, it’s time to get out and hike the local trails and byways. Here’s a hike that will do more than help your heart; the funds you raise will support the Residential Hospice of Grey Bruce. In Ontario, residential hospices are funded by the provincial government for only a portion of their operation – making their contribution specific to the costs associated with the salaries for nursing and personal support work at the bedside. This means all other aspects of the hospice’s operation, such as medical equipment, patient meals and other comforts, are supported by the community. Get your pledge forms at the website above, and plan on heading out this Sunday, May 3. The Meaford hike registration begins at 1 p.m. at the St. Vincent Roman Catholic Church, at the corner of Cook and Collingwood streets. 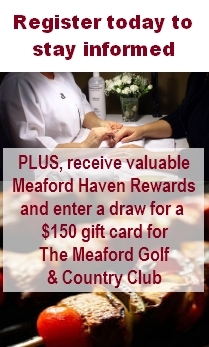 For more information, visit the site or call Wes Sparling at 519-538-3196. On Saturday, October 22, Doug Barber will celebrate his 65th birthday by running 65 kilometres along the Tom Thomson Trail. And he’s looking for others to join him. In addition to marking a birthday milestone, Doug is raising money for the Tom Thomson trail. The run starts at 8 a.m. at Owen Sound’s Soccer Complex and consists of a 6.5 kilometre stretch to Hibou Park, which runners will complete 10 times (five circuits). For Doug, the run will probably be a breeze. Last weekend he won his age division at the Canadian national 50-km trail running championships. But this kind of commitment shows how, in a decade, the trail has grown from a notion to an exciting new way to enjoy the countryside between Meaford to Owen Sound. 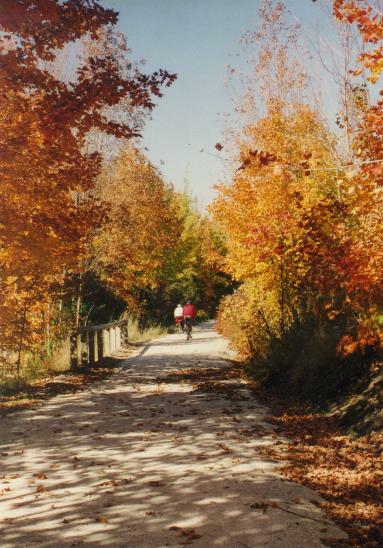 Back in 2001, a group got together with the goal of creating a non-motorized, multi-use (biking, hiking and horseback riding), three-season (spring through fall) trail between Owen Sound and Meaford. There was no existing abandoned rail bed to follow, so the group had the opportunity to create their own route. “This has been an opportunity to build a trail from scratch, one that shows the best vistas, tackles fewer obstacles and passes through the best of our beautiful countryside,” says the trail’s website. Starting in Meaford at the bridge by the harbour, ride the trail through Meaford, past homes and the Knights of Meaford hardwood factory. Then it’s an easy grade (trains couldn’t handle too steep a hill), out of town between stands of trees. At the first road crossing as you leave town, you could venture off the trail for a quick look at the beautiful 1860s home known as Swarthmore Farm, built by Cyrus Richmond Sing, who was Reeve of St. Vincent Council at the time the rail line was built, and served as a Director of the North Grey Railway Company. Down an adjacent tree-shaded road lies Meaford’s scenic Lakeview Cemetery. Back on the trail, you’ll parallel the highway, with opportunities to detour for refreshments at Grandma Lambe’s or Almond’s Fruit Stand. 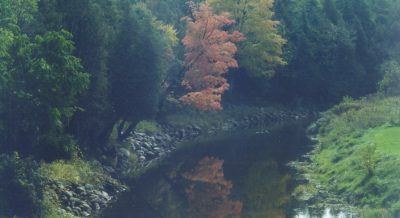 As you enter a small section of County Forest, you’ll pass over the steep banks of Workman’s Creek, named for Captain Workman, a pioneer who settled with his family at its mouth in the 1800s, followed soon thereafter by a gate which leads to the site of an old brick factory high atop Meaford’s clay banks (private property today). Some seven kilometres into your ride, you’ll cross Christie Beach Road. If you’d like a dip in the waters of Georgian Bay at this sandy beach, cruise down the hill and jump in. Remember, you need to climb back up the hill when you’re done! A couple more kilometres brings you to a sharp left in the trail. This detour was created during the construction of Lora Bay, an exceptional golf club and residential community with dramatic views of Georgian Bay. A stop at the Clubhouse might be in order to wet your whistle. But if you don’t stop here, Thornbury is a mere four kilometres down the trail, with numerous restaurants (and at least two ice cream vendors right near the trail.) On the way, you’ll pass the impressive 15th tee on your left, a par three to a green sitting 200 feet below, with a beautiful view of the sweep of Georgian Bay cradled in the trees. After winding through Thornbury, you’ll emerge at a highway crossing. Cross carefully and continue on, or ride along the highway for a short bit to visit Peasemarsh, a secluded public beach. The trail continues past Georgian Peaks and past Craigleith Provincial Park, a small camping park on the shore, and Northwinds Beach, reputed to be one of the birthplaces of windsurfing. Soon after, you’ll cross Blue Mountain Road. If you like, venture up into the resort area to see the sights and visit the Village. Or simply stay on the trail and continue on to Collingwood. The trail enters a fragrant lilac grove at the old train station at Blue Mountain Road, where you can stop to visit the Craigleith Heritage Depot’s exhibit. Beyond the lilacs, the trail cuts away from the highway through woodlands; past streams where beavers work to create their own little ponds; through stands of cedars; and past Cranberry Resort Golf Course before reaching the trailhead near Harbourview Park. Rest awhile here, and head back the same way, take a different route along backcountry roads, or call up that friend who’s coming to pick you up to take you home. Click “next” on the page to see more photos. At about 7 p.m. on November 14, 1872, the first locomotive rolled into Meaford along the newly-laid rail line between Collingwood and Meaford – built by the North Grey Railway Company. Until then, the village had shipped and received goods via ships and along the primitive roads of the time, and while various interests petitioned for a railway, it looked unlikely. According to Charles Cooper’s Railway Pages, it was Gooderham & Worts, the Toronto distillery, which may have finally spurred the development of the line. The Northern Railway, which operated in Simcoe County, wasn’t convinced of the value in extending a line along the southern shore of Georgian Bay. But Gooderham & Worts had recently underwritten the construction of the Toronto Grey and Bruce Railway – arrowing northwest to Owen Sound to bring back the distillery’s primary supplies: firewood and wheat. To compete, the Northern gave authority to North Grey Railway, formed by politicians and business interests from Meaford, Collingwood and nearby communities, to build the line – with the ultimate goal of extending it to Owen Sound. The first station stood on the west side of Sykes Street, near the top of “Station Hill”. (A small parkette now fronts the road here, with the rail yard long gone and a subdivision taking its place.) By the turn of the century, a new spur line to the harbour and a new station allowed more efficient access to industry and shipping. 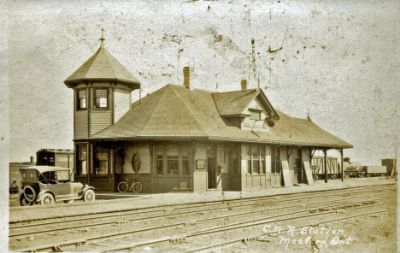 For years the railway served Meaford’s economy, brought in holiday visitors, and carried soldiers from the Meaford base overseas to the war in Europe, welcoming those that returned. But regular passenger service ended in 1960, and by then freight service had dropped to a train a day. The old station fell to the wrecker’s ball in 1965. Next up, a tour of the trail. One of the things that’s great about Meaford Haven is its proximity to attractions everyone else needs to travel far to experience. Hop in your car, and within a half-hour drive on scenic country roads, you’re at Scenic Caves Nature Adventures. 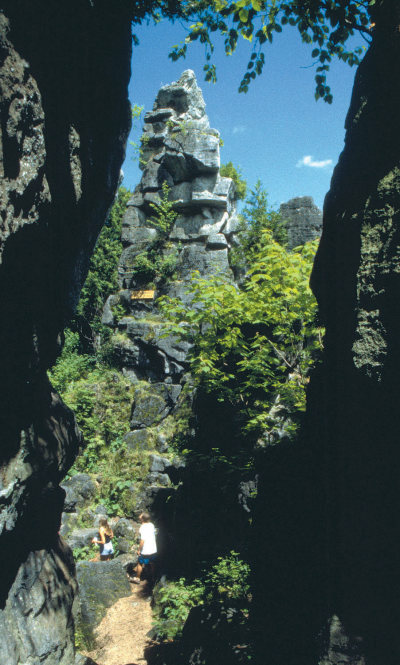 The site, high on the Niagara Escarpment above Georgian Bay, has attracted people for centuries. 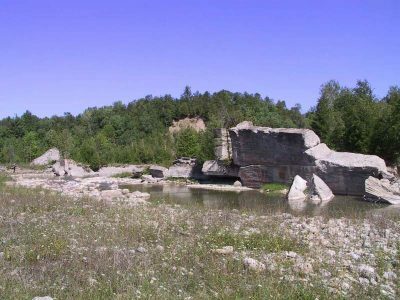 A huge standing rock, carved by erosion from the cliff at the site, was seen by the Hurons as Ekarenniondi, the rock that marked the path to the Village of the Souls, or the Afterlife. “Today, no-one disputes that the sacred Rock marking the trail to the Village of the Dead, which is at the same time Ekarenniondi, The Watcher and Oscotarach, the Head-Piercer, is the rock long so identified at the Scenic Caves,” writes Collingwood archeologist and historian Charles Garrad. “It is the only rock which meets all the tests implied in the legends,” he writes. But with the arrival of European settlers to the area in the 1800s, the area was more noted for its vistas and the narrow caves that wind through the area. Locals would climb up to the site to picnic, and back in 1850 someone carved their initials in one of the caves – leaving marks still readable today. The property eventually became a farm, which operated until an enterprising businessman purchased the property in 1932. Aflred Staples built wooden ladders and bridges and offered guided tours of the caves. An irrepresible showman, he called himself the “Man of Nature”, and performed feats and stunts to attract visitors, including crossing the ice of Nottawasaga Bay to Christian Island and walking from Collingwood to Chicago. His daughter, Sandra took over the operation in the sixties, and ran it for the next quarter century with her husband, adding amenities and building a gift shop. Then, in 1993, Collingwood businessman Rob Thorburn bought the property. Convinced it could be more than a homespun tourist attraction, he invested heavily in the property, adding attractions and activities to make Scenic Caves Nature Adventures a true tourism destination. The Nordic Centre A groomed cross country ski trail network that retains the feel of a backwoods ski route, with trees bounding trails that haven’t been cut wide to accommodate large-scale groomers. The Centre also includes snow shoe trails. Ski and snow shoe rentals and winter warmups make for a full winter experience. The Suspension Bridge at Scenic Caves Ontario’s longest suspension bridge offers views toward Collingwood, Georgian Bay, and beyond to the Penetanguishene Pensinsula – from a vantage 300 metres above the Bay. We promised some more background on the incredible opportunity to hike near your Meaford Haven home, and we definitely have to mention the Bruce Trail. 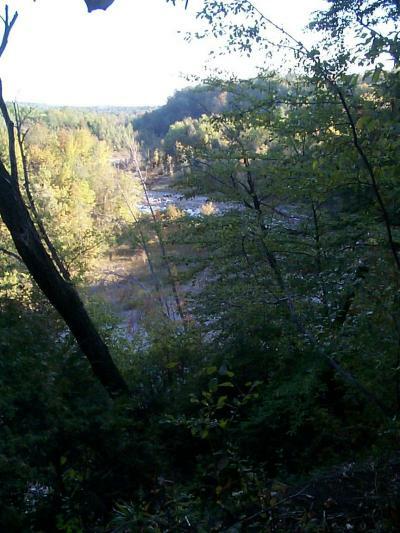 The famous trail, which snakes along the “Giant’s Rib”, the Niagara Escarpment, for nearly 900 kilometres, has numerous nearby access points with a wide variety of terrain and magnificent views, and two of the nine Bruce Trail clubs base themselves here. You can be on the trail within minutes of leaving your door, with access to four different hikes within eight kilometres of Meaford Haven and many more nearby. The Beaver Valley section winds 113 kilometres from Craigleith to Blantyre (southwest of Meaford), through fields and forests and along the edge of rocky cliffs, and offers hikers expansive views of Nottawasaga Bay (part of Georgian Bay) and the Beaver Valley. 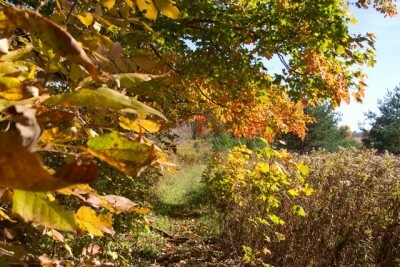 The Beaver Valley Bruce Trail Club schedules numerous hikes throughout the year in this section. Beyond Blantyre, heading west and north, you’re into the Sydenham Bruce Trail Club’s “domain”, which extends all the way up to Wiarton on the Bruce Peninsula. The group develops, maintains (and hikes) the 170 kilometres of trail (plus side trails) in this section. In addition to its spectacular views and beautiful waterfalls, this section is famous for its ferns. When we first arrived in Meaford, we took immediately to exploring the winding trail down the Bighead River, accessible from the Bakeshop Bridge, right in the middle of Meaford. Within a minute of venturing into the woods, all traces of the town disappeared, and you could imagine yourself in the wilderness. The trail, worn by hikers and fishermen and kids on bikes, wound through dense cedars, lofty open hardwood bush, and sometimes right along the Bighead – lazy and inviting in the summer. 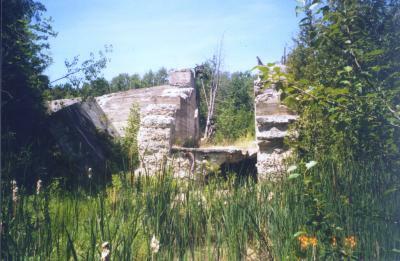 The usual goal was the ruin of the old turn-of-the-(last)-century hydro dam about 2 1/2 kilometres down. Here, weathered concrete ruins, like old castle walls, leaned over the river and formed a small labyrinth. Once, we saw kids from a family picnic on the other side jump off a section of the wall into a deep pool in the river. Another time, after biking down, we crossed and discovered a flat raised area, now overgrown with trees, that we figured must be the site of John Muir’s old cabin, built when the now-famous naturalist and environmentalist arrived here in 1864. Well, we were wrong. A few years later, an archaeologist working with a group known as the Friends of John Muir identified the site a couple of minutes eastward. Around the same time, another group, The Bighead River Heritage Association, embarked on further establishing and marking the trail to complete a 14 kilometre route from Meaford to the 7th line and back. The inaugural hike of the Trout Hollow Trail included historical talks, an introduction to rare ferns of the region by the late Nels Maher, and somewhat unnecessary (but fun) assistance crossing the river from military Zodiacs. Today, the trail is well-established and includes wooden walkways and stairs at some of the more challenging obstacles. Along the way, you visit the ruined dam, pass the site of Muir’s cabin and the old Trout Hollow sawmill, follow the old water race to the power station, and wander among the ruined grey walls of the old station. The trail is mainly easy to moderate hiking with some difficult steep ridges. Access points at either end allow you to hike half the trail if you have a ride arranged. Be sure to wear hiking shoes, protect yourself during peak mosquito season, and keep an eye out of poison ivy. If you’ve been around Meaford lately, you might think that we’re obsessed with hiking and cycling trails. Two weekends ago, a ribbon cutting ceremony at Meaford’s Fred Raper Park celebrated the completion of the Tom Thomson Trail, a 43 kilometre trail system connecting Meaford to Owen Sound. And then, last weekend, the scissors were out again for the grand opening of the Trillium Trail, which meanders through the woodland at Memorial Park. And that’s just for starters. If you’re looking for great retirement activities, hiking and cycling have got to be two of the best. 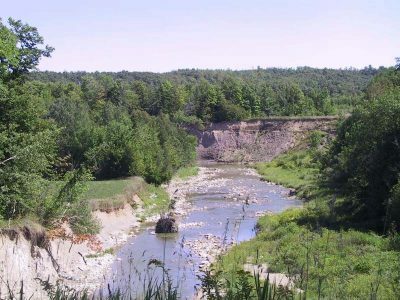 And if you’re in Meaford, you can take your pick from a variety of trails offering everything from challenging climbs to easy strolls, with views and vistas of Georgian Bay, rolling hills, dramatic crevasses, steep cliffs, flashing rivers and bucolic fields. 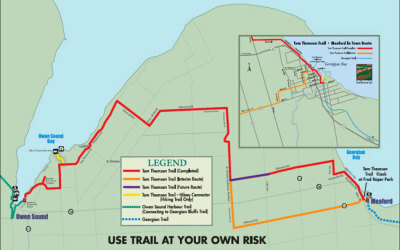 As well as the two recent additions to Meaford’s trails, you have the Georgian Trail which follows the old Northern Rail Line from Meaford to Collingwood. And it seems no matter what road you take, you’ll come upon access to sections of the famous Bruce Trail as it winds and doubles back through the beautiful Niagara Escarpment. Then there’s the wonderful Trout Hollow Trail along the Bighead River and the rugged trail through the Bayview Escarpment Nature Reserve (which is also part of the Niagara Escarpment Biosphere Reserve). We’ll dig out the hiking boots and give you a tour of some of these natural local wonders over the next few weeks, starting with Trout Hollow tomorrow.